That’s right, Minnesota fans, our team was actually lucky to have placed as high as 9th in the Western Conference in 2017 and 10th in 2018. In 2017, Minnesota United found themselves with an astounding -26.4 expected goal differential (xGD)—a performance topped only by the 2013 Chivas team—with Colorado limping in a not-so-close second at -14.8 xGD. The 2018 season had Minnesota with a xGD of -13.6, only 1.2 xG ahead of last year’s runner-up, but this time Minnesota happened to have a few other teams stink more than they did; Colorado somehow outdid their putridity from the previous year, while Orlando, Chicago, and San Jose found new lows to which to aspire. The defense was terrible. Historically terri—did I say this yet? It’s been widely published how Minnesota has two of the four worst seasons by goals conceded in MLS. I’m not sure how much more there is to say, but here we go. Minnesota had 69 yellow cards last season, topped only by New England (79) and Colorado (90). Error after error after error after error after error after error after error after whyyyyy... after holy cow… after HOW DO YOU FORGET ABOUT ZLATAN FREAKIN’ IBRAHIMOVIC SIX YARDS IN FRONT OF GOAL?!?!?! In their two games each against San Jose and Colorado (note their appearance in the list of bad teams in paragraphs previous), they lost all four, conceding a whopping 11 goals and scoring only 5. I think that’s enough pain inflicted for now. Let’s watch something fun! Although the offense appeared inspired at times, Minnesota was a below-average 15th in the league in expected goals for (xGF) and 16th in actual goals scored. They achieved more than 2.00 xGF in only four games last season. Only San Jose and Colorado had fewer, with two such games. On the bright side, Darwin Quintero was a revelation, not only for his triad of keeper-frustrating chip goals—two of which were a part of the club’s first hat trick—but also for how he became the focal point of the offense. “The Scientist” had 0.37 xA per 96 minutes; only Romain Alessandrini and Alex Muyl had higher rates (both at 0.38)! He combined such passing skill with a respectable 0.31 non-penalty xG/96 (tied-42nd) to achieve 0.67 non-penalty xG+xA/96, good enough for 11th in the league (minimum 1000 minutes), joining the likes of Zlatan Ibrahimović (0.68), Carlos Vela (0.67), and Raúl Ruidíaz (0.66). Early ACL tears for Kevin Molino and Ethan Finlay left a hole at right winger, and what once was a position of depth opened the way for Miguel Ibarra. After “Batman” played only 1872 minutes in 2017, the 2014 NASL Golden Ball winner proved once and for all he deserves to be in MLS, earning the team’s top points above replacement in 2018 and playing in all but one of Minnesota’s matches. He even earned some speculation in the USMNT circles, and given the newly discovered demand for his services, Loons fans have been dreading the day the front office ships him off a la fellow NASL superstar Christian “Superman” Ramirez. This was certainly a year to move on from. Moving on, then. NASL holdover Ibson was one of the team’s most financially efficient contributors over the past two years, and the team had a hard time letting him go. He providing plenty of entertainment every game, and he scored arguably the cheekiest goal in all MLS history; he also led the team with 12.3% of the club’s touches when playing in 2018. But his age combined with his tendency to be caught out of position when transitioning back to defense ultimately brought about his departure. Silly gaffes didn’t help either. All-around great guy Jérôme Thiesson was a surprising cut given his mid-range salary for a starting fullback, but the injury history is what caused the team to move on. Maximiano showed some promise as the “go out and immediately get a yellow card” kind of tackler, but ultimately the team couldn’t secure his purchase from Fluminense. Adrian Heath favorite Alexi Gomez was a disaster in nearly every aspect. Despite showing massive talent, he failed to score a goal or an assist in 18 appearances and suffered frequent discipline errors, culminating in an utterly unnecessary penalty committed in late July. The rest of the losses were unremarkable and predictable. As 2018 began and especially as the season came to a close, it became obvious sporting director Manny Lagos had to upgrade several positions: attacking midfielder, defensive midfielder, central midfielder / primary possessor, central defender, both fullbacks, and goalkeeper. Yes, that’s more than half the team, but considering what you’ve heard so far, does that come as any surprise? Pretty much the only thing Minnesota had in bulk & quality was wingers, much to the amusement of the MLS community. Lo and behold, Minnesota fans appear to be getting what they want (minus the controversial Ramirez trade): the signings in 2018 and this offseason have made a surprising amount of effort to fill the holes. Darwin Quintero, the team’s first designated player, solved the problems plaguing the creative playmaker role early in the season. Minnesota’s third DP Ján Greguš was originally hailed by many as the solution to the defensive midfielder problem this offseason (due to his playing the position in Slovakia’s 4-1-4-1 formation), but as Osvaldo Alonso came in as a TAM signing, it became obvious the former Seattle Sounder would take on the mantle of protecting the back line while Greguš would play in his more natural position as a central midfielder farther up the pitch. Now that the center of the pitch was solidified, there was one aspect Minnesota had hardly addressed yet: defense. And unless you’ve been living under a snow drift for the past two years, you’ve known MNUFC needed better defenders. The MLS season was only a month away, and strong concern was setting in that the front office would yet again neglect the defense. Then two miracles happened. Romain Métanire, a quality Ligue-2-level fullback, was signed using TAM in late January. TAM on a fullback? You know that’s right. After Thiesson’s option was declined, and since Eric Miller hadn’t been re-signed, second-year player Carter Manley was the only true fullback on the roster. Francisco Calvo had moved from central defender to left fullback during the 2018 season, solidifying the latter but still requiring an upgrade in the former. What’s that? The 2017 MLS Defender of the Year is the third-highest-paid center back on Sporting Kansas City’s books? Let’s go out and get us some Ike Opara with most of the Ramirez trade money! According to whoscored.com, Minnesota placed second to last in aerial win rate last year and third to last in corner kick accuracy, and the club has lacked a physically imposing defender to win headers on both ends of the pitch. Opara has been solid in this area; who doesn’t need a player who can do this or this? There was one position left which needed addressing: goalkeeper. Despite his resume of spectacular saves for Minnesota, Bobby Shuttleworth had terrible distribution last year, and there were accusations he confused his defenders with some of his instructions. Minnesota needed and upgrade, and an upgrade they did get in former Premier League keeper Vito Mannone, on loan from Reading FC. Prior to that acquisition, the Loons added depth and future potential with one of the top goalkeepers in the SuperDraft in Dayne St. Clair. Can you believe it? Minnesota United FC actually filled all of its major holes in the past year and actually has depth in a few positions! In my assessment, much of Minnesota’s ability to sign the volume of quality players they have may have to do with the completion of Allianz Field and its movement into maintenance mode. As a phenomenal project manager once told me, if you have the ability to move spending from capital expense to operating expense, it makes the life of the CFO much easier. Getting rid of the risk inherent to project capital may have allowed the team to take on more financial risk in the form of player acquisitions, particularly DPs and GAM/TAM players. I fully expect Adrian heath to keep the team in his old faithful 4-2-3-1 possession-based strategy, but this has the look of a completely different team from the ones we saw in the last two years. Though the team may be one of the oldest in the league, the core should be solid for a couple years if all goes well. Below is how I see the starting XI shaping up. Newly-acquired Vito Mannone should start between the posts, with Bobby Shuttleworth playing the backup. Dayne St. Clair could be loaned out to Loons partner USL side Forward Madison FC (the “Flamingos”), though they appear to already have a quality starting goalkeeper, so St. Clair likely wouldn’t get much playing time there. Given the relative “depth” at central defender and lack thereof on the left side, Francisco Calvo begrudgingly shifted over to the left fullback position in mid-September, and many have praised the move as an attempt to get more out of Calvo’s attack-supporting talents while not risking the integrity of the center backs’ positioning. Minnesota rejected a $2 million offer for Calvo last year, so he’s probably not going anywhere any time soon. He’ll be backed up by either the versatile Eric Miller or 15th overall SuperDraft pick Chase Gasper. At center back, it’ll be Ike Opara and one of Michael Boxall and Minnesota native Brent Kallman. During the preseason, Opara has showed off his phenomenal passing skills, playing excellent long balls and splitting defenders to find open teammates; he looks to be a fantastic addition to the team already. Kallman and Boxall went back and forth as starters until Calvo shifted out wide, in which case Kallman and Boxall both were starters. Heath has favored Boxall in the past, but Kallman may be close to overtaking his inclinations. It’s a close race, but I’m giving the nod to Kallman, since he has started next to Opara on the first team in the preseason games so far. Eric Miller is the universal backup for the entire back line, but a player to watch is second-year center back Wyatt Omsberg. Through some of the defensive lapses of last year, he showed some promise in limited minutes, starting four games, but it will be interesting to see how the SuperDraftee will fare if the team’s depth is tested. Romain Métanire is the obvious starter on the right side of the defense, and it will be interesting to see what sort of stability he can bring to the position. Eric Miller’s natural position is right fullback, and he will likely be the top backup to the Frenchman. Depth fullback Carter Manley showed some promise during the preseason with some excellent passes and a fantastic tackle versus Phoenix, but a few ill-advised passes and a silly attack-killing offside offense demonstrated his inexperience. Rasmus Schüller led the team in both tackles and passes in 2018. With Ján Greguš and Osvaldo Alonso expected to take on the central midfield roles (with Greguš likely playing a bit higher than Alonso), both aspects should see improvement, but it leaves Schüller without a defined role. I imagine Schüller will be the super-sub for nearly all the midfield positions; this preseason, Heath has been trying him in a more attacking position than he’s previously played for Minnesota, slotting him in as a “inverted midfielder” of sorts due to the coach’s belief in his shooting abilities. As previously stated, Osvaldo Alonso should fill the role of “protector of the defensive line”. His fierce tackling and phenomenal organizational abilities should immediately provide a boost to the team’s defensive capabilities, and I’ve heard much of the offensive possession this preseason has gone through him. He brings the control to the midfield which was lacking in years past. Ján Greguš immediately steps in as the [looks up oft-cited but never explained soccer position numbers again] number eight, also known as the central midfielder. He should take some pressure off Quintero in the key passes & assists department, given his consistent production in that department in the past. This preseason, the team has also been trying him out as their corner-kick-taker, a role he played for his former team, FC Copenhagen. United is counting on him to be the yin to Alonso’s yang, providing sound defending while being the organizer of the offense. With the midfield solidified, Collin Martin drops farther down the depth chart, but he is a decent backup. SuperDraftee Hassani Dotson appears to have earned his position in the roster as a depth defensive or central midfielder, though he has played as a right fullback in his preseason appearances so far. When healthy, the combination of quality and depth at the winger position is unparalleled in the league. Kevin Molino, Ethan Finlay, and Miguel Ibarra are all MLS-quality starters, and though we haven’t seen much of Romario Ibarra yet, he’s shown potential to be worth the fact that his paycheck was the highest of these four last year. 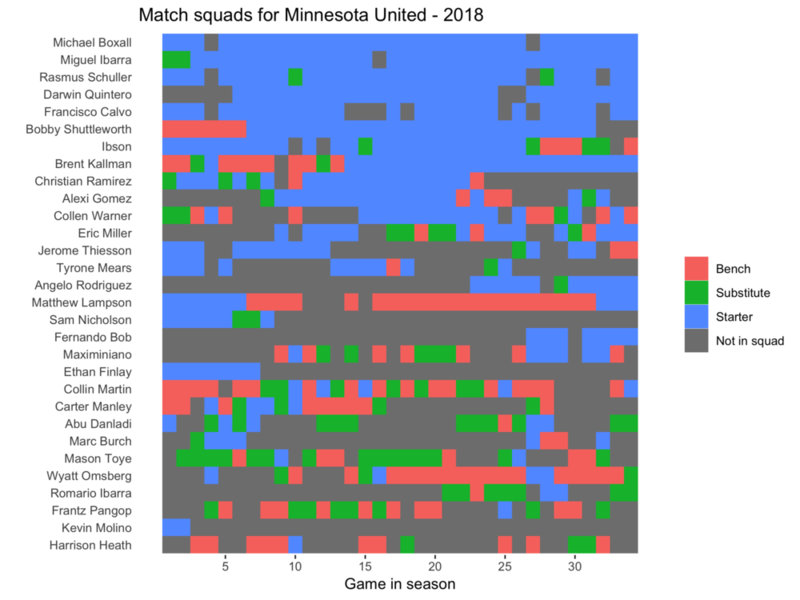 Miguel Ibarra came into Minnesota preferring the left winger position, but with the injuries to Finlay and Molino, Ibarra played on the right for most of the 2018 season. Heath was reluctant to start him at first, but he has put Ibarra in the first team at right wing for the 2019 preseason so far. It’s anyone’s guess as to who Heath will start at the position, but I’m going to go with the dueling Ibarras to kick off the season. Once Molino and Finlay are fully recovered, though, that could change. Darwin Quintero is the team’s second striker / attacking midfielder / substitute center forward depending on the formation, but almost certainly he is and will continue to be the focal point of the offense. And he’s been trying out those keeper-chippers again this preseason. Kevin Molino was tried in the central midfield role in 2017, but he just wasn’t as effective being the focal point of the offense as he was being creative on the outside. But you never know: he could be the one Heath turns to in case of a lack of Quintero. Up top is DP Ángelo Rodríguez. If Abu Danladi can stay healthy, he should see minutes either in the striker position or as an outside attacker. And as long as Mason Toye can reign in his frustrations and stay disciplined, he’ll get his chances this season as the front man as well. What can we expect from the Loons in 2019? The additions of Mannone, Opara, Alonso, and Greguš have given the team much more of a build-from-the-back look than late last season’s “kick ball far” farce. Frankly, those four acquisitions will probably do more for both the club’s defense and offense than anything Adrian Heath could do from a tactical perspective. The defensive weakness of last year often caused the team to overcorrect, leaving Quintero stranded trying to dribble his way past the entire opposing defense. Strengthening the defensive manpower and adding proven passers into the mix should give this team what it needs to compete for a low-end playoff spot. And really, after the product they’ve seen these first two years of this MLS adventure, I don’t think the Minnesota fans can ask for anything less.